“A Family Tradition in Snow Removal"
Being a snowplow contractor can take its toll on a family but Travis Schmock wouldn’t change that for the world. He grew up in a snow removal business and now runs his own. Travis loves being able to pass the tradition down to his sons as he takes them snow plowing with him every chance he gets. Schmock owns Schmocks Landscaping in Ludington, MI. He has been plowing for twenty years and ten years with all BOSS products. 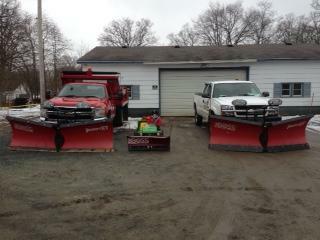 He owns over 25 BOSS products ranging from truck and UTV plows to box plows and spreaders. 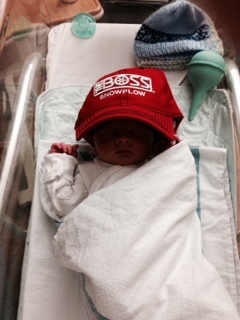 “I switched to BOSS products ten years ago and I will never run anything other than BOSS as long as I plow snow. BOSS blows other plows out of the water in performance,” Schmock explains. Schmocks Landscaping plows 70 snow events a year from big factories to school systems. Ludington, MI receives 90-120 inches of snow depending on the lake effect weather that blows in from Lake Michigan. “I always have to be prepared with Lake Michigan right in our back yard. I check in with crews before storms hit and let them know any changes to their routes. I personally go out and patrol sites and assess weather conditions,” Schmock states. If you would like to be featured on our blog, click the link below and submit your information. A big thank you to Travis Schmock for sharing his story and being a dedicated BOSS Owner! If you are a BOSS Owner and would like to be featured on our "Like a BOSS" blog stream, submit the form and you will be contacted to share your story!